Surgery HTML Template is built for Medical, Hospital, Health Clinics, Surgery, Cosmetic Surgery, Facial Surgery, Plastic Surgery Clinic, Wellness, Medical Organization etc. Surgery Cosmetic Landing Page Template is a premium HTML based on the Bootstrap Responsive Framework, built for medical related business such as cosmetic surgery, dentistry, chiropractor, doctor or hospital industry. This template is useful and web elements for plastic surgeon and medical clinics, modern colors, elegant curves and simple forms, free and bonus icons and free font from Google Fonts. Surgery Landing Page Template is fully mobile Responsive Html Template for Hospitals dentists, doctors, surgeons, hospitals, health clinics, pediatrics, psychiatrist, psychiatry, stomatology, chiropractor, veterinary clinics. This minimal template is being packed with tons of features like Contact Forms, Gallery Images, and product section. This HTML Template has a wide range of Short-Codes that can be used for any types of websites also. 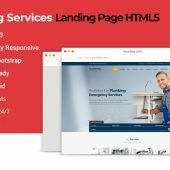 Surgery Landing Page Template is a fully responsive Bootstrap 4, HTML5 template specially designed for Medical, Clinic, Dental, Dentist, Doctor, Health, Healthcare, Hospital & Medical care website.